Andrew Cherry, playwright, song writer, poet, comedian, and wit. 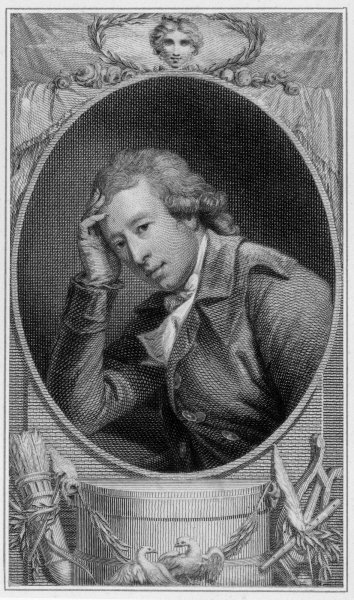 Andrew Cherry was born the eldest son of John Cherry, a printer and bookseller, on 11 January 1762. He was born on the site of the former post office on Bridge Street and was raised a member of the Society of Friends (A.K.A Quaker). He received a good education in Limerick, as his parents wished for him to enter the holy orders, but instead at the age of eleven he was apprenticed to James Potts, a printer, in Dame Street, Dublin. From a young age Andrew acquired a taste for the stage. This was partially due to James Potts love of the arts, who would seldom attend the theatre without young Andrew with him. At fourteen Andrew Cherry made his first appearance as Lucia in the tragedy Cato in a large room at the Blackmoor’s Head, Tower Street, Dublin. At 17 he abandoned his apprenticeship to take up theatre life full time. He played his first independent performance in Naas, in a company of strolling players (which consisted primarily of runaways), only to return to Dublin after a short interval, half-starved and penniless. This did not deter him and after a few years’ steady work, he joined the company of theatrical which was managed by Richard Knipe. After Knipe’s death Andrew Cherry married his daughter. He travelled with a company of actors through Ireland for about 6 years where he was known as Little Cherry. Andrew Cherry’s opera, The Outcast (1796), was produced in Drury Lane, London. At Belfast he acquired considerable reputation, and in 1797 he won success at the Theatre Royal, Dublin. He then accepted engagements in England, and his performance at Bath was pronounced “as finished a picture of the scenic art as had ever been performed on their boards.” In 1802 he appeared at Drury Lane, London and in 1804 produced The Soldier’s Daughter. Other pieces followed, and he continued to act at Drury Lane until it was burned down in 1809. After this Andrew took a company to Wales, with Edmund Kean as leading actor. He died at Monmouth on the 7th of February 1812, aged 50. Crosbie Row is also called Cherry Place after Andrew Cherry. His best known song was The Dear Little Shamrock of Ireland, which was brought into the 20th century by Irish tenor John McCormack. In each climate they ever appear in.